When I was first diagnosed with breast cancer, I wanted to read blogs to find out how people actually managed the treatment and the experience of having cancer. How bad was treatment, and how long until they got over it? What was it like? What would hurt, what wouldn't? Medical information was easy to come by and is always so blandly written. (Cough cough) I wanted to know how people really felt and what really happened. Later, when I was diagnosed with end stage cancer, the question changed - how long do I have? An unanswerable question but one that everyone who has been diagnosed with terminal disease feels they must know. Yes, I got my paperwork in order, wrote down my passwords for my family - but would I see my son graduate? Would I see another birthday? How long does it take to die from cancer in the liver? It no longer seemed as important to know how to manage the disease as it was to find out how long I would be able to manage. The information was easy to find, or so I thought. Only 18% of women lived 36 months after their liver mets diagnosis, and median survival is 14 months. But I also knew that statistics apply to a large group, with many different health conditions, treatments, ages, and other variables that are not relevant to me. It's why my oncologist doesn't guess. Statistics are also old - it takes time to do the studies and time to publish them and by the time they have been linked to enough times to drive them up google's rankings, they are out-of-date. Newer therapies (like Herceptin and Perjeta) are not counted among them. Those newly diagnosed are told not to look at statistics online for a very valid reason - they don't relate to an individual human being. Rebellious, I still wanted to know. Like my early need to find and read blogs that told of personal experiences, I now wanted to discover real people who died of cancer and how long it took them. Morbid? Maybe a little, but it's like telling an ethnic joke - it's okay if you are part of that ethnic group. 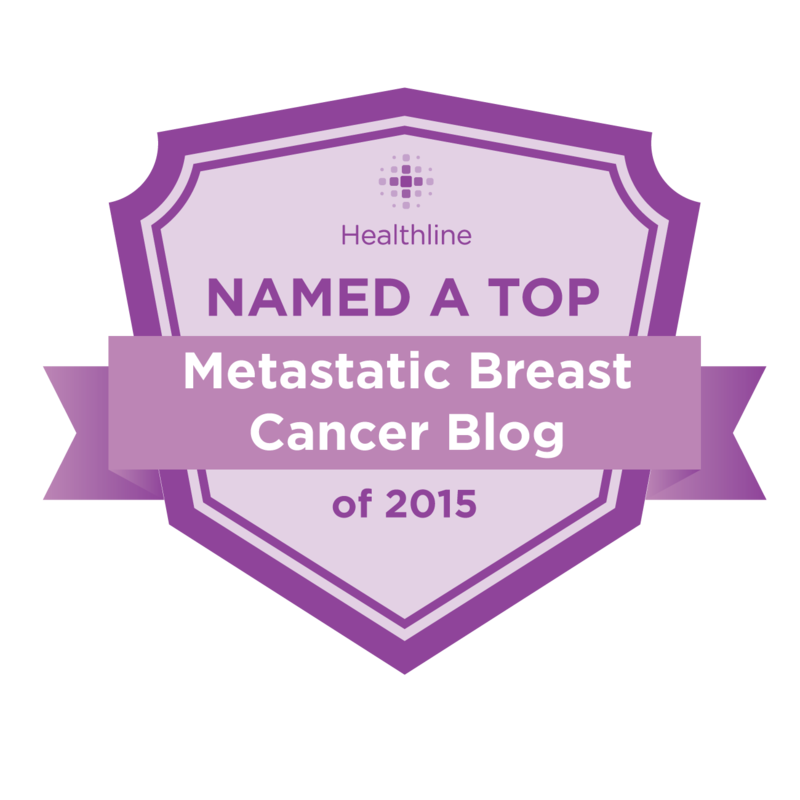 I found a very active forum of women who had been diagnosed with end-stage breast cancer. I set the time on the forum three years in the past and searched those posts for "liver mets." I found and wrote down everybody who was active and who had liver mets, and I followed their stories. Many had the same treatments I did (SBRT, Herceptin), some had other new therapies, some had a few mets like me, others had many more. Many were doing fine at that snapshot in time, in treatment or remission. A few were quite ill. They were all somewhere along the continuum of cancer treatment. I then clicked on their username to see when their last post was. Then, I set the time to the current day and looked for those women. Now, of course, that didn't necessarily mean they'd died because they'd stopped posting on a forum. Like me, many of them could have decided that a forum has no value for them and went on to live their lives forum-less. But most of us active in social media have taught our family members to make "the" death announcement (mine will be here) and so I looked for those "last posts." Nearly all the women I'd found had truly died. It appeared to me, with that small sampling, that 3 years was a long-range goal, inline with what I'd read medically. 2 years was realistic. Okay, that was settled. I had two years, three at the outside. I knew it could be more or less, but that was the average with real people. But I also had a child who just turned 14, a sophomore in high school, a kid who still needed a mother. That wasn't an acceptable timeline for me. I wanted to finish raising him. None of this 2 year stuff - I needed the full 3 years. One of Kubler-Ross's stages of death is bargaining. Not being religious, I have nobody to bargain with, yet I did it nonetheless. Only I called it goal-setting. I was going to do everything possible to live to see my youngest son graduate from high school, three years one month after mets diagnosis and nearly six years after my cancer diagnosis. I wanted to know what college he'd be attending and I wanted to make his bed in a dorm and do all those things parents have done for generations to settle their kids into college. I wanted to finish my job of raising him. Even if I couldn't do everything physically that I used to do, I would still be there to offer motherly advice and cheer him on. And, I'd know the direction he was headed even if I didn't see the outcome. It was a very long, unimaginably hard three years. I had half my liver removed. I did microwave ablation. I did chemo after chemo (seven in all). I survived a terrible bout of c-diff sepsis. I continue on 3 targeted infusions. I did SBRT (popularly known as gamma knife). I had about 50 scans. I followed the latest in treatments to enhance my chance of going the distance. I slept more than I was awake, I took pain meds and rarely left the house except for doctors appointments. Even if I had to go to his graduation carrying oxygen or in a wheelchair, I was going to be there. Yesterday, the final college acceptance came in. May will be my 3rd year anniversary with a mets diagnosis and he graduates this June and enters college in September. Today, barring a catastrophe, I believe my dream has come true. 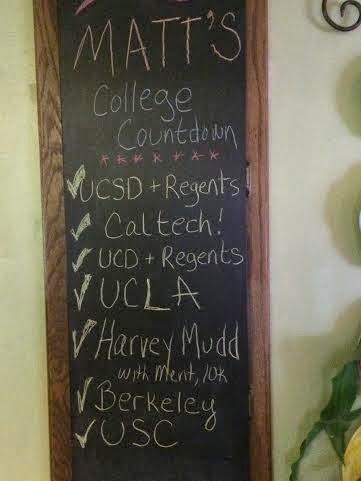 As the acceptances came in, I kept track of them on my chalkboard. Above are the colleges my son has been admitted to. Out of those fantastic opportunities, it seems very likely that his choice will be Caltech, although Harvey Mudd has sent an attractive financial package. 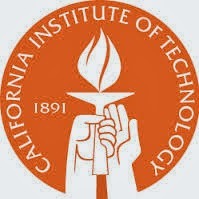 We have not received one from Caltech yet. I'm so grateful that my wish has come true, that I was here to see where my son's college days will be spent. Knowing he was accepted to schools like Caltech, Harvey Mudd and some amazing UCs pretty much means his future is assured. He could mess it up, sure. But I also know he won't. I am also pleased that he will be in California and I'll be able to have him come home for all holidays - it's a short plane ride home from Caltech (or Mudd), and if he surprises me and goes to Berkeley or Davis, just a drive. Yes, I am planning ahead a little, something I haven't done in a long time. I don't want to get too confident. Like on the TV show Survivor, those who feel they are running the show are pretty quickly kicked off. I am well aware that I'm not running the show. I will not have to leave this earth worrying about either of my children - both are doing well. I can't tell you what a good feeling that is. Yes, there will be the ups and downs of life and I probably won't be there to soothe them or give advice, but I did my main job. My stepdaughter got married during a time when I was quite ill from chemo. Her wedding was lovely, in a forest, with a big bonfire afterwards. Travel was hard for me then (even a drive) but no way could we miss it. I was on some Taxane then, post-cdiff still. About 83 pounds and mostly bald. The weather had been predicted to be in the 100s so I had bought a sundress but it turned out to be a cool day in the 60s and so I was freezing, even with a wig. We went shopping in a charming little town to get me some tights and something warmer for my feet as well as an extra sweater. Still, even with those things and the coat I'd brought, I wasn't able to function long in the cold and looking back on the photos, I really did look sick. During the wedding though, I was in a peaceful state, loving the friendship and family that surrounded my beautiful stepdaughter on this happy day. I hated to leave that atmosphere that is not often created - where everybody comes together in harmony and love for the people involved. Physically though, I was simply not up for it. After the ceremony and some toasts, I had to go back to the room to warm up and sleep, leaving my husband there to enjoy the bonfire and camaraderie and share in the love expressed by his daughter and new husband. Then came the announcement that she was pregnant, and so now I had another reason to hang on. 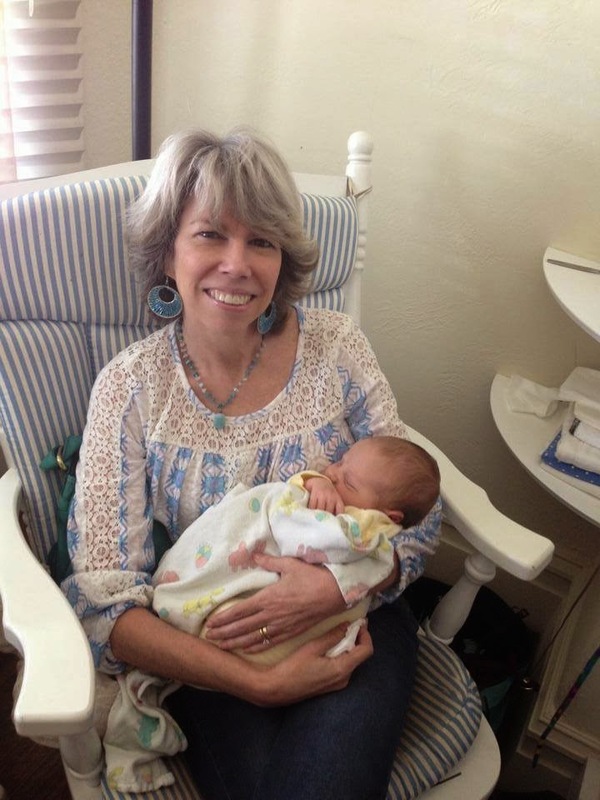 It may be presumptuous of me to call myself grandmother as the child is not biologically mine, and I don't think they really think of me as a grandmother, but I do so anyway. The child won't care about blood, and I already love the little boy fiercely, and who can object to more love for your child? I didn't know I had another reason to live, but seeing the first progeny of this generation of our big, crazy family is wonderful. Many people are brought together by this one, small, beautiful being. I still don't know how long I have. I'm doing very well, better than I have been for years but there is a pain in my liver that glows like a coal. It may be surgical remains or may be cancer growing. I can't guess and I no longer understand cues from my body. One of the things I discovered when I did my cancer stalking was how quickly people died. They would be posting about their next treatment and hoping it would work, or even how great they felt, or some trip they were planning, or sometimes they''d post, frightened, that they had jumped from remission to having a liver covered with tumors and what should they do? Then a month later, two, no matter what they'd said - a death announcement. One women died a week after her long-awaited Hawaiian vacation. The three year mark could still be a reality. As long as I live until September, I'll have completed my goal. My son will have graduated, and I will get to make his bed in his dorm room. I will kiss him, wish him luck and hand him the keys to adulthood. I did the job I was given to do on earth, and raised my children. I have seen the next generation, whose future is bright because of two loving, devoted parents and a slew of people who will fill his life with love. Of course, I'd like to see my oldest get married, have a baby, see my youngest graduate college. I'd love to see the grandbaby start to walk and talk and run and climb and develop a love for dinosaurs. And, maybe I will. Maybe I'll continue to beat the odds and be that outlier. But I've decided I won't do more bargaining or set more goals. I just won the lottery, I can't expect to win twice. I am just going to appreciate every brush of the wind on my cheek, every blooming flower, every visit with my grandbaby, every contact from my children, and just LIVE. I'm not sure why I was so lucky when so many were not. Many women whose children were younger than mine succumbed to cancer quickly, and I know that they felt as deeply as I did that they wanted to see their children grow up. My friend Sarah, gone now for over 2 years - her babies were just toddlers. My friend Sandy, her son was 17, the same age as mine. There is definitely an element of survivor's guilt at play in my life. This disease, it's a terrible crapshoot, a roll of the dice. We with mets - we are all going to die but who gets the time they wanted and who does not? With every scan is a new roll, and that next roll can scoop it all away. So far, the dice have been in my favor. I'm very lucky. I'm very grateful. Ann, you are so blessed! I know that you said "Not being religious, I have nobody to bargain with, yet I did it nonetheless." I thought of this post while I was reading your blog... http://www.glennbeck.com/2014/03/31/god-lives-and-it-is-all-true-glenn-reflects-on-the-passing-of-his-father/ - this article about his father's passing was amazing. Glenn said that his dad wasn't a believer but he kept an open mind...I am praying for you and your family. Keep setting goals...and thank you for the beautiful words! Ann, you have such a joy and spirit, such life! So glad you are reaching your goals. I hope and pray you get to make the dorm bed and see that grandbaby walk. Beautiful post! As a new stage IV with my own 14 year old, I can so relate to so much of what you've written. Wishing you time to see more dreams come true. What a remarkable post. But it's remarkable because YOU are remarkable, Ann. I'm so happy you are seeing your goals turn into reality. I can feel your gratitude. Enjoy all the special moments ahead. And the photo is just priceless. Thank you for your words. Always. I love you Ann, you make me see how lucky I am. I tucked both my boys into their dorm rooms, that part made me cry. Maybe 20 years from now, someone will look at a forum to see what she could expect from following your treatment course and see that you are still alive and well. Thank you for reminding me to enjoy the moment. I want to be around long enough to help my 7-year old daughter become a confident young lady, but in the meantime I cherish every moment of beauty I can find, including "every brush of wind on my cheek." So simple and so true. We adopted our son when he was 18 months old. He's my nephew's biological son, my sister's grandson. Between adoptive and biological parents, grandparents, step-grandparents, biological and step-siblings, biological and adoptive cousins, aunts and uncles, this kid has a whole slew of people who are in his life, love him dearly and have all played a big role in helping to form his character. Your step-grandson can only benefit from having you for a grandma for as long as possible. He's a lucky lad to have the loving support of an extended family, as our own boy has been. And congrats to Matt! What an amazing accomplishment that chalkboard list reflects!! I'm so happy that you've been able to be here to enjoy all of this. Holy moly! I don't know if everybody here knows, but those are two of the top five engineering schools in the country-- literally world class. Huge congratulations to Matt! As someone who was diagnosed with Stage 1 breast cancer when my youngest was a freshman at USC, I remember being profoundly grateful that my cancer was discovered after her senior year of high school and graduation, and long after her brother and sister had entered college. I feel extreme sympathy for those who still have kids at home when they are diagnosed. As always, your words are heartfelt and poignant. I know you will be there to help your son move into his dorm room and to make up his bed. Oh, Ann, thank you again for your post. You are a real class act, and I hope you will continue to be a fabulous "outlier", seeing your son progress through college, whichever one he chooses. May much summer sun and pleasant breezes come your way. Ann, what beautiful words you weave and I am blessed by them. In all frankness, we should, every single one of us, live precisely as you are now, not taking any day for granted, not worrying about a year down the road, but soaking up the sunshine in the present moment, for it is all any of us have. Thanks for being real. I'm so happy your dreams are coming true and wish you an abundance of happy days in the future. What a great post. So nice to see your dreams coming true, and so many blessings coming your way. Beautiful post. So happy you got to see these stages!